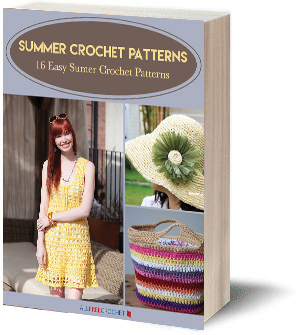 Spruce up your summer with cute crochet ideas from this FREE e-book! From hot crochet patterns like beach cover ups to beach bags and other summer crochet ideas, this book has it all. Just in time for spring and summer, these Crocodile Stitch Flip Flop Toppers turn an inexpensive pair of flip flops into a fun pair of everyday shoes. You can personalize this crocodile crochet stitch pattern with your favorite colors or pick colors to match a specific outfit. The great thing about these easy crochet patterns is that they're accessories so you can put them or leave them off. Perfect for the pool, beach, shopping, vacation or anywhere you want to go!